Description: Ballast train in the hole at Trumann on the BNSF Thayer South Sub. Description: A nice looking GP60M on the North Runner. 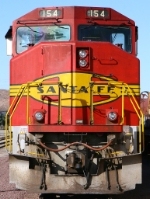 Description: BNSF 154, BNSF 2448, BNSF 2292, & BNSF 106 are the drag out power for a long cut of manifest. Photographed at 08:48. Description: BNSF 154, BNSF 2448, BNSF 2292, & BNSF 106 are the drag out power for a long cut of manifest. Photographed at 12:02. Description: I was so happy to catch this! Description: ROUND FOUR, HEADLIGHTS ON AND ITS REALLY RAINING! Description: BNSF 154 and 161 arriving at the Watson wye. Description: BNSF GP60M's 154 and 161 drag a train through the Watson wye from the Harbor sub. 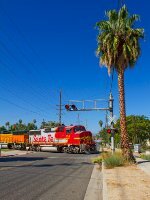 Description: BNSF 154 crossing Torrance blvd. Description: Saw these outa the corner of my eye and had to take a quick grab shot. Description: Two BNSF GP60M locomotives headed for MotivePower in Boise for something, work/rebuild/testing/sale? Description: Fresh from MPI rebuild, BNSF 154 returns to Kaiser as a GP60M-3. Description: BNSF 529 & 154 Backing out of the Fernley industrial park lead to go East. Description: BNSF 154 & 529 Departing East. Description: BNSF 154 & 174 Leaving the industrial siding back to the main line. Description: BNSF 154 & 174 Eastbound on the main line in Fernley. Description: BNSF 174 & 154 Local sitting on the side track waiting for the eastbound afternoon Z train to come by. Description: BNSF 174 & 154 Local sitting on the side track waiting for eastbound afternoon Z train to come by.